"Christmas Day Miracle Walk & Dark Chocolate"
"First, our "Christmas Day Miracle Walk”. a pod of resident orcas swam by. And, the second tradition is dark chocolate!" Hope your holidays are miraculous (and chocolatey), too! merry, merry & happy 2014! Welcome the return of Light! what we no longer want or need in our life into the darkness. to experience and enjoy in our life. 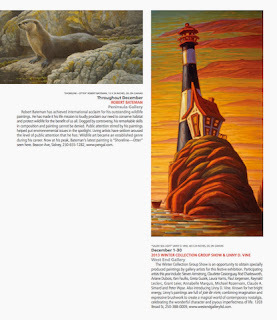 From the December issue of FOCUS Magazine, Victoria BC Canada. Let's all go to Linnyland! Robert Bateman & Linny D. Vine sharing a page!! Wild Times in Linnyland at the "West End Gallery Winter Collection & Linny D. Vine Preview"
"Winter Collection & Linny D. Vine Preview"! Victoria's 16th Annual Gallery Walk!